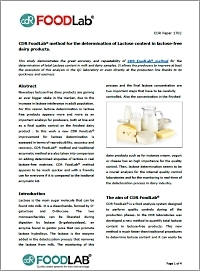 CDR FoodLab® method for the determination of Lactose content in lactose-free dairy products. In this work a new improvement for lactose determination is assessed in terms of reproducibility, accuracy and recovery. New method and traditional enzymatic method are also taken into comparisonon adding determined aliquotes of lactose in reallactose-free matrices. The new method, that is in CDR FoodLab®, appears to be much quicker and with a friendly use for everyone if it is compared to the tradional enzymatic kit. Milk testing: chemical analysis of lactic acid in milk. The presence of lactic acid or lactate in milk is due to the fermentation of lactose caused mainly by lactic bacteria. Generally speaking, just-milked milk does not contain lactic acid, but this increases after a while and its concentration is closely correlated to the total bacterial charge. Find out why the chemical analysis of milk urea nitrogen is very important to companies that deal with the transformation and packaging of milk and dairy products, to institutes assigned to the control and to dairy industry research laboratories. The researchers of CDR’s laboratories have developed a new method to quickly assess milk thermal processes in an easy, rapid and reliable way. See the results of the study, presented at the 2002 Congrilait – Paris. The central research and development laboratory of PARMALAT S.p.A carried out a study entitled “Assessment of a fast method for milk thermal processes: e-fructosyl-lysine” aimed at determining whether the innovative FoodLab method for the control of dairy products could be used as a preliminary screening test to distinguish different types of thermal processes (pasteurization, direct and indirect UHT).